Mega yard sales this weekend. That's why I'm up at 5:30 am. Gotta get the jump on it and get out there first and find all those treasures, right? The abundance of yard sales this weekend started yesterday and I was there. I was there to score one of my best ever thrifty garden junk finds. 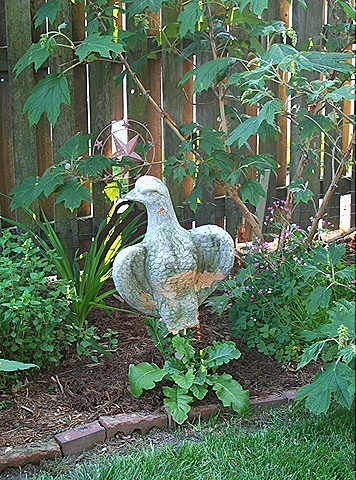 This big (almost 2ft tall) proud eagle is now keeping watch in my perennial border. He came off the frieze of a historic home in the Olde Wythe section of Hampton. He is beyond awesome. 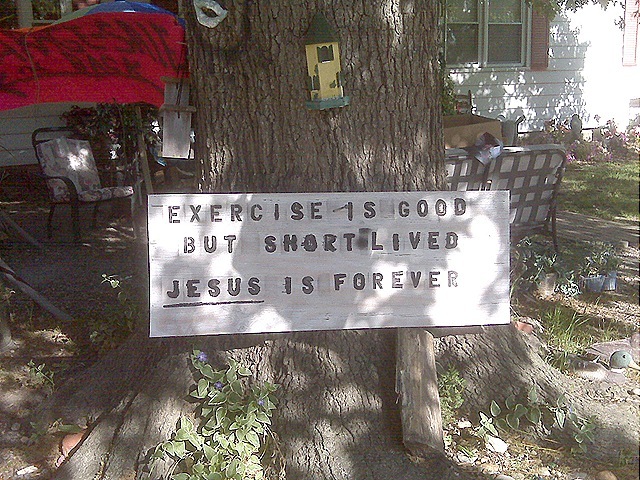 At another sale I saw this sign in the front yard. What the? Okay, so what else did you score? You are a better woman than I…went out at 8:30 and bought a single cookbook…oh well, there is always next week! Yeah, I repeat those sentiments over the strange sign! I went to about thirty garage sales today. Most were in one gated neighborhood. Didn’t find one thing there! Finally at another I found a $3 mirror. Came home with money in my pocket. Can you imagine? YOU GO GIRL!! Get lots of fabulous finds! Just make sure to share them with us. As far as the sign, at least they mean well. and I am SO, SO GLAD that you came home with that WAY COOL BIRD and not that sign! !